Tell a friend or colleague about this site! Enter their email address and we'll let them know! The mission of txgulfcoastearlyed.org is to address the human resource needs of the Gulf Coast Region's Early Care and Education Workforce through the sharing of resources. If your CDA has a credential date of January, 2002 or later, you are eligible for Renewal Amnesty. On March 1, 2012, the Council for Professional Development launched the Renewal Amnesty Program, which allows anyone who has earned or renewed a CDA in the last ten years to apply for renewal, even if their CDA has expired. This program will only last until December 31, 2012. Do you want to become a registered trainer in Texas? The Texas Early Care and Education Career Development System (TECECDS) provide an avenue for early childhood practitioners and administrators to do this. Click this link to find out more information about the steps to follow. Get tips and ideas for teacher appreciation, and learn how to motivate staff. 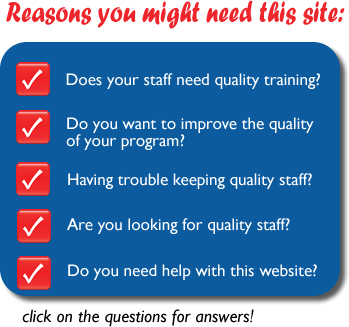 These articles and links will help answerquestions about staff retention and provide ideas for retaining top performing staff.